And NO, the Ramblas isn’t one of them! My first visit to Barcelona, I remember being a bit frustrated when I went out at night. I’d heard all about how lively it was, but wandering around the streets of the Gothic Quarter, I saw lots of people who seemed to be going somewhere, while I kept coming across streets full of closed-up shops. I felt like all those cool “somewheres” must be just around the corner, but I was just missing them. When I got to know Barcelona better, I realized my suspicions had been 100% right. There are plenty of streets full of happening stuff round the clock – but sometimes it takes a bit of searching to find them. So, here are some of the coolest streets in Barcelona, where you’re almost guaranteed to have a good time. I haven’t included three of the biggest tourist attraction streets in Barcelona – Las Ramblas, Passeig de Gràcia, or Portal d’Angel. None of those are places that I go when I want to have fun. They’re good for sightseeing and shopping, but not much else. Lately, Blai Street has become a buzzing spot for pintxos bars. Pintxos are from the Basque Country, and are generally made up of a piece of bread topped with a mouthful of something delicious. When you walk into a pintxos bar, you get handed a plate and directed to the bar, which is full of platters of appetizing bites. Just grab the ones you want and start tucking in! You can have as many or as few as you like, or hop from bar to bar sampling just one or two. Blai is packed to bursting with pintxos bars, so lots of them have rock-bottom prices to lure in customers. You can have a very cheap and very nice dinner here. Picks on this street: All of them are pretty similar. Just go for the one that has the best-looking pintxos on the bar! Good for: coffee and cakes, chocolate! Chocoholics, step this way! 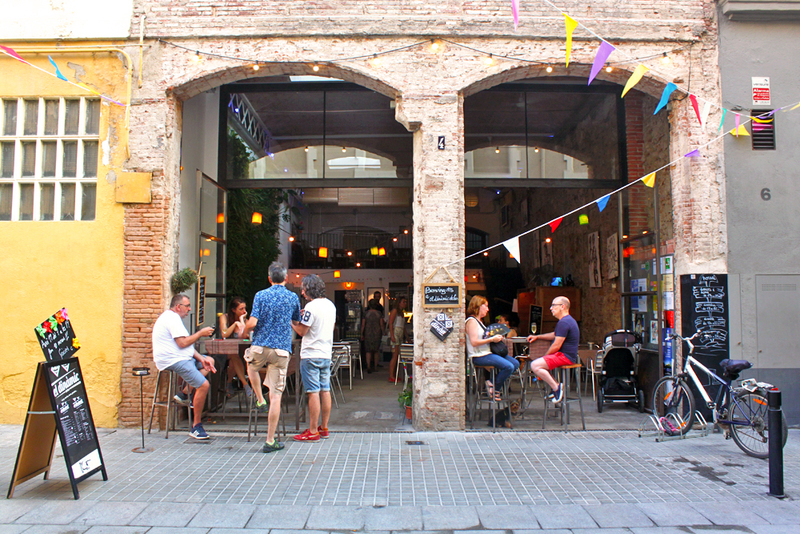 Petritxol street is filled with cozy cafés serving up ‘chocolate con churros’. Diet-friendly this is not, but it certainly makes for a luxurious treat on a chilly winter day. (Yes, Barcelona does get a few of them). The setting on a narrow, centuries-old stony street framed by a Gothic church at the lower end only adds to its charm. Don’t miss the ceramic tiles on the walls of the street while you’re here. Many display rules about how to be a nice neighbor, and remind residents to do things like drive slowly and be polite to each other. Picks on this street: Granja Dulcinea and Granja La Pallaresa – both for chocolaty treats. The semi-pedestria Enric Granados starts from the University of Barcelona gardens and goes all the way up to the grand avenue Diagonal. It’s near enough to the city center to be easily accessible, but just far enough away from the main attractions that it’s not touristy. Go here to find a selection of charming cafés and quirky art galleries. At the lower end of the street, there are lots of airy cafés with carefully-outfitted artsy types seated at the bar. Further up, you’ll find a couple of seriously stylish restaurants filled with well-dressed patrons. What almost all the places have in common on this street, though, is that nearly all of them have outdoor terraces with tables and chairs. 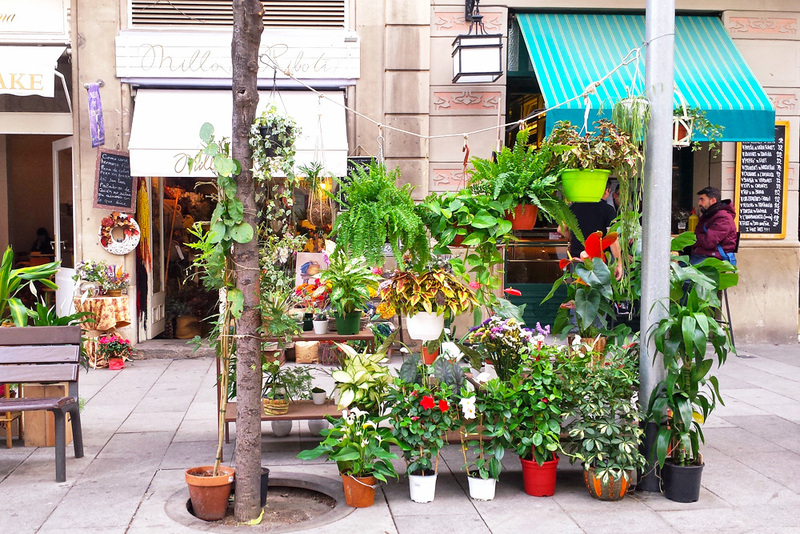 Picks on this street: Cosmo for cake and coffee, Delacrem for ice cream, Brunch & Cake for, well, brunch and cake, Millo de Riboti for gorgeous flowers. While you won’t find many clubs in the bohemian Gràcia district, there are plenty of tantalizing bars and restaurants that make for an excellent night out – and you might end up staying out til 3 in the morning anyway! This is also where part of the Cines Verdi is, which shows interesting movies in their original language. It’s one of the best places to see movies in English in Barcelona, especially if you’re looking for things other than Hollywood blockbusters. A great place to start your night is at the picturesque Plaça de la Virreina, a pretty square presided over by a huge church and lined with trees and tapas bars. Work your way down the small street, and you’ll find a handful of cute bars and restaurants that are perfect for a romantic night out. Picks on this street: Chatalet for cocktails, Cafè del Teatre for a romantic setting, Cines Verdi for great movies, Mama’s Café for lunches and coffees (the staff can be a bit grumpy, but their outdoor terrace makes up for it). 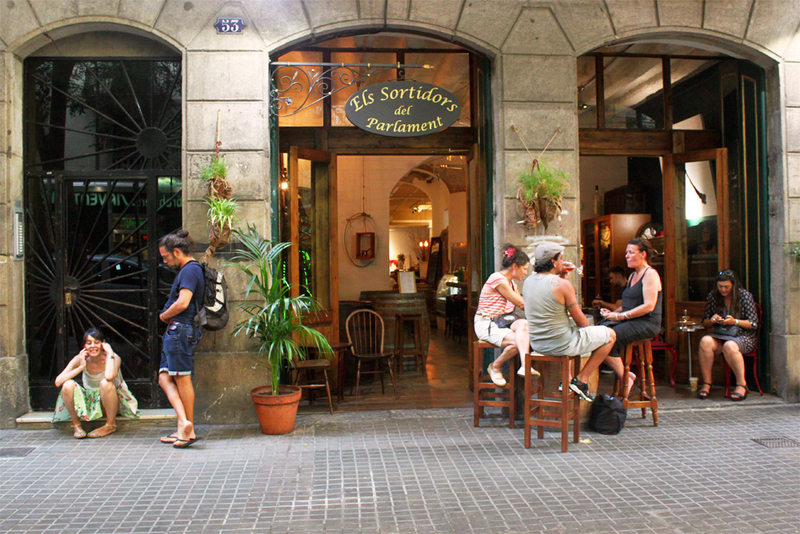 Sant Antoni is where it’s at for Barcelona’s throngs of hipsters, and there’s no hipper spot than Parlament Street. In spite of this, there are some genuinely cool places you can find here. Brunch and vermouth joints abound, and on sunny days it can be nearly impossible to get a table at one of the coveted terrace tables. People come in big groups of friends and sit for hours catching up over tapas and drinks. Don’t go here at night, though – the whole vibe dies down completely, as lots of the restaurants shut down. This is a good place to take kids who might be picky eaters – the brunch places usually have a mix of things they’ll recognize and like (eggs on toast, for instance) alongside innovative stuff that grown-ups will like (think quinoa salads). 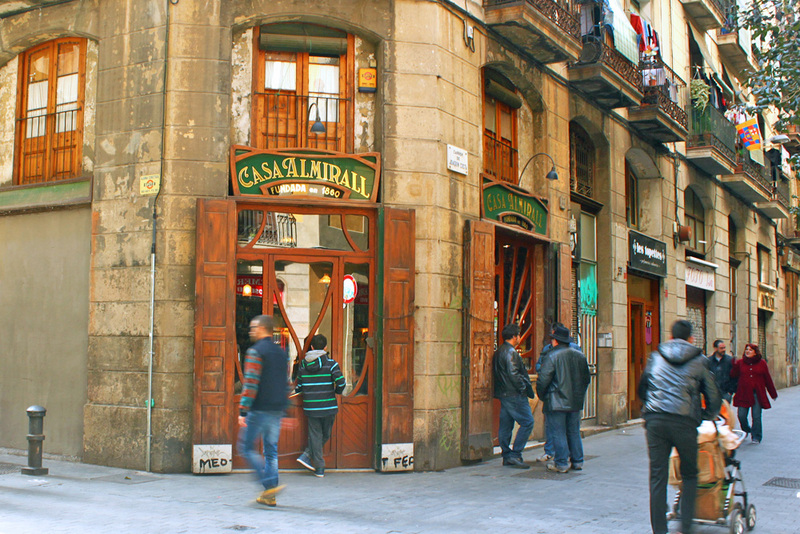 These two nearly-adjoining streets near Plaça Reial are a surefire way to find a great drinking spots in the city. From dive bars to cocktail lounges, there are all sorts of fantastic places to drink here. Start at the top near C/Ferran and make your way down until your group can decide on a place that suits their fancy that night. Be extra-careful of pickpockets here. This section of the Gothic Quarter is full of tourists drinking the night away – in other words, easy targets. Don’t be one of them! Picks on this street: ALL OF THEM. I once racked up 11 bars in a row here on a lazy Sunday. Which was followed by an equally lazy but rather painful Monday. Similar C/Rauric, this is a nearly guaranteed spot to find a watering hole that suits your party plans. These long streets cut through a huge swathe of the Gothic Quarter’s lower end, and have just about any kind of bar you could want, from campy cocktail bars to traditional fisherman’s taverns, and even an Irish pub or two. Curiously, there are quite a few Asturian bars around here too (though not many in the rest of Barcelona). Try your hand at pouring ‘sidra’ and enjoy it with strong Cabrales blue cheese. Or, sample the ‘leche de pantera’ – panther’s milk – a painfully sweet and efficient way to get tipsy. The Raval is always a safe bet if you want to do some people-watching, and Joaquín Costa street is full of some particularly curious characters. It’s got a mix of halal butchers, trendy design shops, and funky bars. Plus, there’s an equally diverse crowd strolling between the offerings. There are plenty of spots to choose from to start your night out here. You’ll be right in the heart of the old city center – so you’ll be well-positioned for a long night out. Picks on this street: Café Almirall for a historic modernist bar, 33/45 for hipster fun. Look in the window of A la Presma d’aquella dia for a glimpse of a slew of old newspapers. 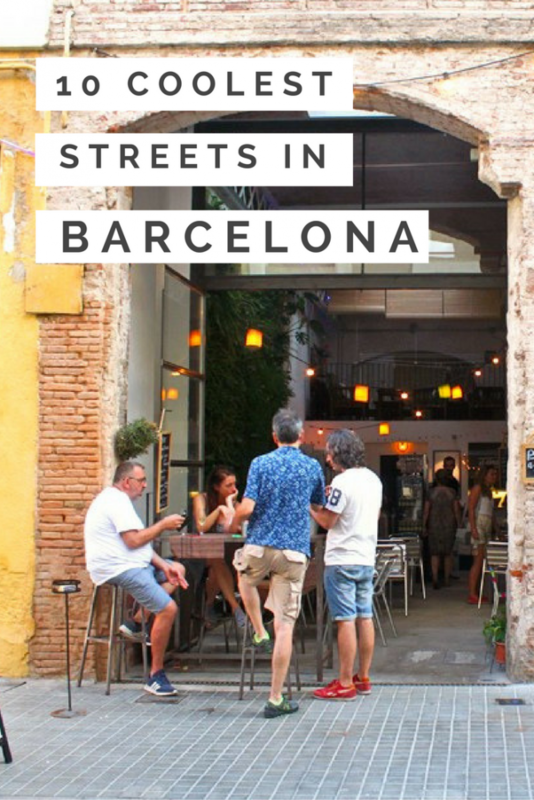 What do you think are the coolest streets in Barcelona? I’d love to know if there are any I’m missing out on! Great post! Will have to keep these in mind for next time I’m in Barcelona! Thanks for this post, I sometimes also struggle to find cool places in one location. I knew some of them, like Eric Granados, but most of them are new to me! I’m glad you found some new places, Natalia! 😀 I’m sure there are quite a few more streets like this to discover. A great selection! I’m always wondering where the locals are eating when I go on holiday. I’ll have to save this for next time I go to Barcelona – I’m dying to go back! Great list. C/ Parlament is a recent “discovery” of mine. I also like C/ de la Boria, C/ dels Corders, C/ dels Carders (they continue each other). Both feature cool shops of different kinds and lots of interesting places to eat: from a bunch of tapas joints (El Atril, Bona Sort) , Asian (Mosquito, Grasshopper Ramen) and South American places (Cafe Alsur, La Fabrica) and more. Oh thanks for the recommendations! I’ll have to check those out – I’m always looking for new tapas joints, and I’m a little obsessed with Mosquito. Mmm, those dumplings! Alright those places are first in my list when I go to Barcelona. Bar Celta on C/ Merce used to be decent but has regressed massively, i still like Vendimia on the corner next to BoDeBe as it’s a bog standard good value local type of place. Oh Jess, that’s such a beautiful post!! Love the quality photos and the info behind. 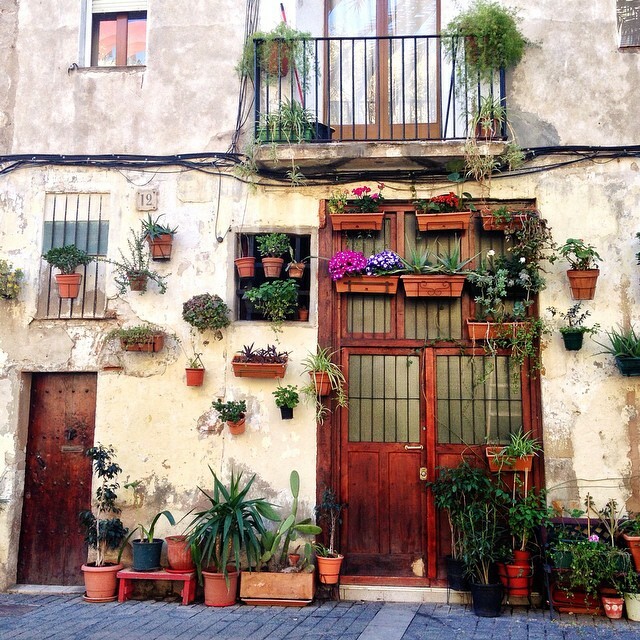 Barcelona has so many beautiful corners to see!! Thanks so much, Matt! 🙂 There definitely is so much beautiful stuff here. What an awesome post! I just got to Barcelona today and this is going to be my guide while I’m here :-). Do you have any suggestions for good shopping streets? 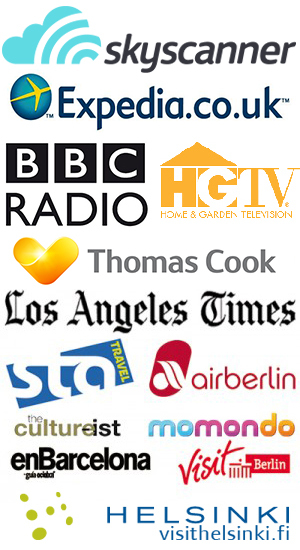 You can find all the main stores on Portal de l’Angel and Passeig de Gràcia. L’Illa Diagonal and Diagonal Mar are the two big malls that have good shops, too. Bit odd you haven’t mentioned El Born. Thank you SO MUCH for these recommendations! Milk was awesome for brunch, and C/Blai was even better than I could have imagined. From pintxos with goat cheese and blackberry courant to sangria and gelato, it was a dream. Thank you!!!! Aww I’m so glad you enjoyed them! 😀 There is SO much delicious stuff to eat on C/Blai – I’m getting hungry just thinking about it haha. Saving this for later! Is Barcelona a wanderer-friendly city? Thanks, Jessica! Loved reading this post. My husband and I are going to Barcelona for our 35th Wedding Anniversary THIS July 2017. We’re in our fifties and in good shape so we’re excited to explore. We’d love to check out where locals go. Of course we’ll do the touristy things but looking forward to just wandering. 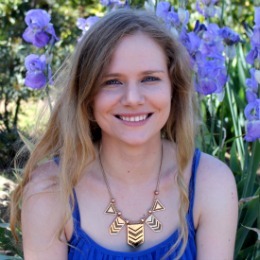 We’ll love the night life (we’re such night owls anyway) So glad I read your post! These are great ones! Some I haven’t seen yet! Is it totally cliché that I actually really like Gran Via and Rambla de Catalunya? Not when its rush hour of course but I love the trees and the pedestrian paths! Me too! Especially Rambla de Catalunya, it’s such a nice street to walk down. Thanks so much for this! I love street recommendations rather than researching particular restaurants or bars in advance. Can’t wait to take a stroll down some of them! My evening spent wandering in and out of pintxos bars on C/Blai was my favorite spent in Barcelona, all thanks to this post! It was well worth the journey from our hotel on Las Ramblas. And the numerous glasses of sangria were all delicious, too! Thank you SO much! Oh I’m so glad to hear you had a nice time, Rachael. 🙂 Happy you found my post helpful too!